One of FIRE’s most shocking cases in 2008 was that of Keith John Sampson, a student-employee at Indiana University–Purdue University Indianapolis (IUPUI) who was found guilty of racial harassment for merely reading the book Notre Dame vs. the Klan: How the Fighting Irish Defeated the Ku Klux Klan during his work breaks. Thanks to FIRE’s involvement and the extensive media coverage of the case, the finding against Sampson was eventually overturned and his school record was cleared, but the story behind this incident is still disturbing months later. During the media storm that followed Sampson’s case, filmmaker Andrew Marcus decided to produce a short documentary in the hopes of restoring Sampson’s reputation that IUPUI sought to destroy and bringing to light the incidents of censorship that are all too common on college campuses today. The documentary features interviews with Sampson, FIRE President Greg Lukianoff, and FIRE Jackson Legal Fellow Azhar Majeed. We’ve posted the entire video below and you can also access it on our multimedia page and at Founding Bloggers. Sampson’s ordeal began in November 2007, when he was notified by Lillian Charleston of IUPUI’s Affirmative Action Office that two co-workers had filed a racial harassment complaint against him. The office alleged that by reading a book about the KKK in the break room, Sampson had engaged in racial harassment. Sampson attempted to explain that the book was a historical account of a 1924 incident in which a group of University of Notre Dame students fought in the streets with members of the Ku Klux Klan. (Indeed, the book celebrates the defeat of the Klan.) This explanation was ignored, and he later received a letter from Charleston stating that he was guilty of racial harassment for "openly reading the book related to a historically and racially abhorrent subject." Six months later, IUPUI declared that Keith John Sampson’s record was clear and said it would reexamine its affirmative action procedures relating to internal complaints. However, in the face of media scrutiny the school’s Director of Media Relations Richard Schneider claimed to The Wall Street Journal that Sampson was actually punished for some other behavior, although he refused to reveal any details of the alleged conduct. 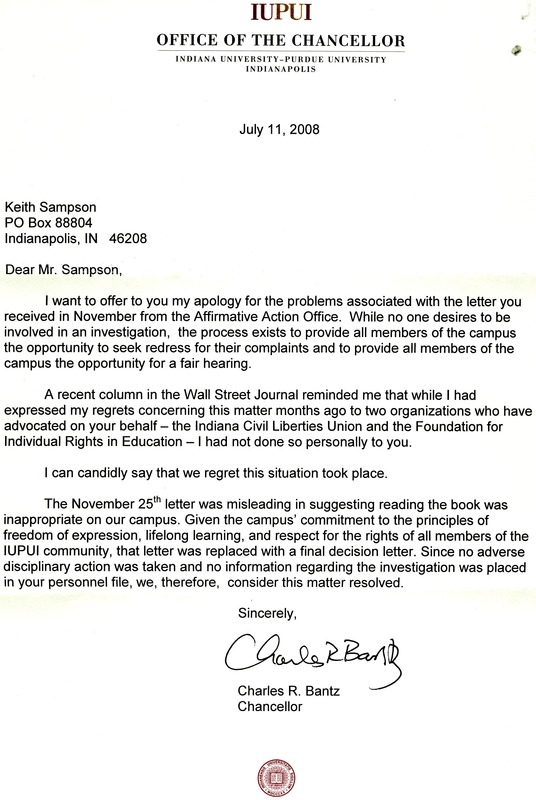 Soon after the Wall Street Journal article was published, the Chancellor of IUPUI, Charles R. Bantz, wrote to Sampson offering his apologies for the way the university handled the entire incident and stated that the university "regret[s] this situation ever took place." However, the letter failed to mention the allegations made by Schneider and FIRE wrote once again to Bantz, asking for clarification of these accusations. No response was ever received and Sampson continues to study and work at IUPUI.